Angela Colley is a key feature within the Cotswolds interior design landscape, possessing an eye for style and a unique ability to provide a beautifully bespoke service for every one of her clients. Angela is a one-woman show who knows no bounds, ensuring quality interior design and styling for your living space, to suit every budget. From contemporary to classical, modern to traditional, minimal to country living, Angela has the knowledge and the experience to help you make your dream home a reality. Angela’s brainchild GeorgieRose offers interior styling to all – no constraints, no restrictions, no problem. With her glass half full mentality and impressive work ethic, GeorgieRose looks set to blossom. iwork4u caught up with Angela to find out how GeorgieRose is growing. Thank you for taking the time to talk business Angela! So firstly, what inspired you to get into interior design? I think it was buying my first home that really cemented my genuine passion for interiors and transforming spaces. A few years later we bought our current home, which over the past 10 years has evolved from a tired, period property into a warm family home. With a bit of love and attention we’ve brought it back to life again! Had you considered any other careers or ambitions you’ve either tried or wanted to try? I’ve always had a creative interest from a young age so this has always been my dream job. I would often spend my Sundays as a teenager rearranging my bedroom furniture around and painting things. Have you always worked within interiors and design? I have been an Executive PA for many years, so very different, but have always had the passion for interiors. I then decided to study and qualify and take that leap of faith. What or who inspired you to take the leap to start your own business? For many years I have offered to help and advise friends and family with decorating their interiors, and it has been their complimentary feedback and encouragement which spurred me to convert my hobby into a career. That really gave me the confidence to start up GeorgieRose. Where does your business name stem from (it’s beautiful by the way)? It’s a combination of my eldest daughter’s first name Georgina and her sister Lexie’s middle name which is Rose. I figured my husband and I had chosen their names so it wasn’t a business name I was ever going to tire of, and I felt that it had a warm approachable ring to it. It certainly does. What advice would you give to those wanting to improve their homes on a budget? I believe it’s really important to really think about how you want the space to work for you and to be mindful and realistic about your budget and expectations, as it can be very easy to get carried away. Mixing up high end items with high street finds will create a look that is not too ‘staged’ and more liveable. Find that one ‘wow factor’ item that will set your room apart. What makes your business unique compared to your competitors? 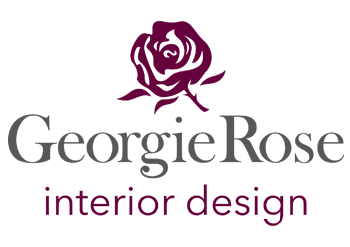 Personally, it’s about making interior design at GeorgieRose an affordable choice for everyone. Many people hear the words ‘interior design’ and instantly think that is an unrealistic luxury for their budget and therefore out of their reach. The reality is a lot of people only need a helping hand or guidance towards bringing their hopes for their homes into reality, and I have tried to structure my services with that in mind. Every client’s needs are different, with new ideas and often a very specific budget in mind. I tailor my services to ensure they’re affordable and scalable, so no matter what level of support a client needs, the level of service never changes. My personal style to date and for those who know me is very much towards period styling, with what I call ‘a touch of glamour’. This was how I styled my own home, however over the past 12 months this has definitely evolved into adding contemporary pieces, taking more risks and combining two looks and styles together to create a more eclectic and dramatic result. I just love walking into a room and my mind will go into overdrive about how that space can be improved for the home owner. It’s a wonderful feeling to embark on a project and see their home space evolve, and then see my client’s delight when the vision comes together. I can leave knowing their new space with be loved, lived in and enjoyed. I’d like to think that GeorgieRose will continue to grow, but most importantly I’ll still be doing something that I genuinely enjoy. As long as that doesn’t change, then it’s all I really wish for.